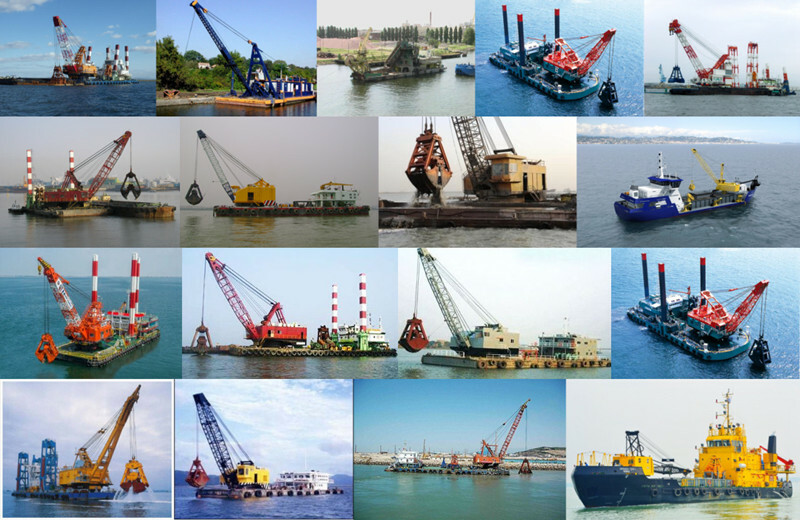 Product categories of Dredger, we are specialized manufacturers from China, Cutter Suction Dredger, Bucket Dredger suppliers/factory, wholesale high-quality products of Grab Dredger R & D and manufacturing, we have the perfect after-sales service and technical support. Look forward to your cooperation! Dredging is an excavation activity usually carried out underwater, in shallow seas or freshwater areas with the purpose of gathering up bottom sediments and disposing of them at a different location. This technique is often used to keep waterways navigable. It is also used as a way to replenish sand on some public beaches, where sand has been lost because of coastal erosion. Dredging is also used as a technique for fishing for certain species of edible clams and crabs (see fishing dredge). For suction-type excavation out of water, see Suction excavator. These operate by sucking through a long tube, like some vacuum cleaners but on a larger scale. A Plain Suction Dredger has no tool at the end of the Suction Pipe to disturb the material. This is often the most commonly used form of dredging. A trailing Suction Hopper Dredger (TSHD) trails its suction pipe when working. The pipe, which is fitted with a dredge drag head, loads the dredge spoil into one or more hoppers in the vessel. When the hoppers are full, the TSHD sails to a disposal area and either dumps the material through doors in the hull or pumps the material out of the hoppers. Some dredges also self-offload using drag buckets and conveyors. The largest trailing suction hopper dredgers in the world are currently Jan De Nul's Cristobal Colon (launched 4 July 2008) and its sister ship Leiv Eriksson (launched 4 September 2009. Main design specs for the Cristobal Colon and the Leiv Eriksson are: 46,000 cubic metre hopper and a design dredging depth of 155 m. Next largest is HAM 318 (Van Oord) with its 37,293 cubic metre hopper and a maximum dredging depth of 101 m.
A cutter-suction dredger's (CSD) Suction Tube has a cutting mechanism at the suction inlet. The cutting mechanism loosens the bed material and transports it to the Suction Mouth. The dredged material is usually sucked up by a wear-resistant centrifugal pump and discharged either through a pipe line or to a barge. Cutter-suction dredgers are most often used in geological areas consisting of hard surface materials (for example gravel deposits or surface bedrock) where a standard suction dredger would be ineffective. In recent years, dredgers with more powerful cutters have been built in order to excavate harder rock without the need for blasting. The two largest cutter suction dredgers in the world are currently (as at August 2009) DEME's D'Artagnan (28,200 kW total installed power)and Jan De Nul's J.F.J. DeNul (27,240 kW).both built by IHC Merwede. This process functions like a Cutter Suction Dredger, but the cutting tool is a rotating Archimedean screw set at right angles to the suction pipe. The first widely used auger dredges were designed in the 1980s by Mud Cat Dredges, which was run by National Car Rental, but is now a Division of Ellicott Dredges. In 1996, IMS Dredges introduced a self-propelled version of the auger dredge that allows the system to propel itself without the use of anchors or cables. During the 1980s and 1990s auger dredges were primarily used for sludge removal applications from waste water treatment plants. Today, auger dredges are used for a wider variety of applications including river maintenance and sand mining. The most common auger dredge on the global market today is the Versi-Dredge. The turbidity shroud on auger dredge systems creates a strong suction vacuum, causing much less turbidity than conical (basket) type cutterheads and so they are preferred for environmental applications. The vacuum created by the shroud and the ability to convey material to the pump faster makes auger dredge systems more productive than similar sized conical (basket) type cutterhead dredges.